Vintage racing—any racing—is serious business. 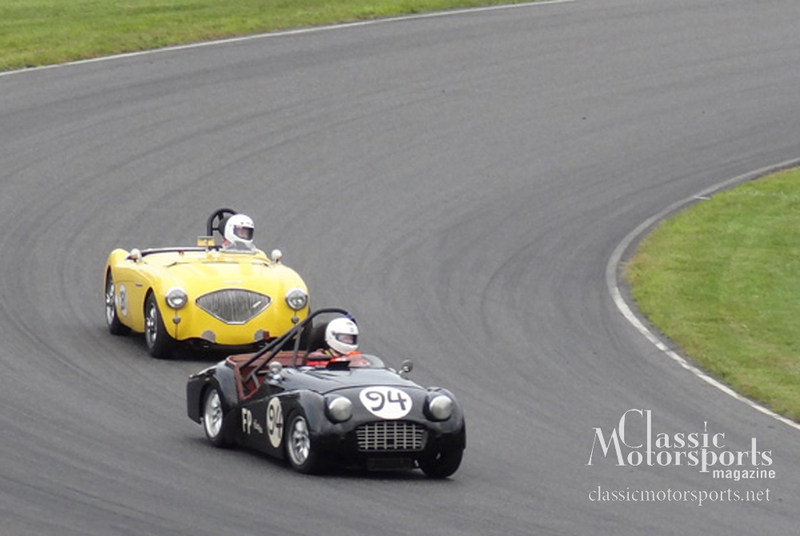 I remember distinctly when I first started competing at vintage events: I was running the Mitty at Road Atlanta in my Formula Vee, and guys in Minis and Sprites were going by me at indecently fast speeds like I was a moving chicane. I was terrified. I felt like I was in the way. There was just no way that I was ever going to be able to make a car dance like that; they seemed to skitter on three wheels through the turns at earth-shattering speeds. In an effort to lessen my fear and get a bit more sheet metal around me, I soon switched to my Triumph TR3. The first time I ran it at one of the Triumph feature events at Mid-Ohio, a guy named Jeff Snook lapped me probably twice. I was shocked and amazed that a guy in a 50-year-old Triumph TR3 was willing to—and could!—drive that fast. Back then, guys like Snook beat me by 15 to 20 seconds a lap. In a group of 50 Triumphs, I was damned near dead last. I soldiered on. I learned. I practiced. I spent money—first on safety equipment, then on a better seat and ergonomics, then on the suspension and finally on a decent engine. I went back, year after year. I learned the tracks and I got some driver coaching. I progressed slowly but steadily: By the mid-aughts, I could at least see the taillights of guys like George Wright, Tony Drews, Mike Jackson and Jeff Snook. I knew I would never beat them, but I was getting closer. Then, in the past year, I rededicated myself to the sport. I went to Skip Barber. I got personal coaching from E. Paul Dickinson. I took my car to Abacus Racing and asked them to go back through it, build in reliability, and infuse it with some of the speed harnessed by guys like Snook, Wright and Jackson. I ran Atlanta. I attended VARA University and learned Buttonwillow. I studied Roebling Road and I learned VIR. I subscribed to the iRacing.com service and further studied the tracks. Then it came time for another Friends of Triumph feature event. We would all meet the first weekend of September at Watkins Glen, a track I had never been to. I was nervous. I had heard that this was one of the fastest tracks in the country. I had also heard that all the Armco barriers were not for the faint of heart. Still, I felt my car was right and this might be my year. I was ready to be one of the guys. I think we all know what I am talking about when I say “one of the guys.” Ever since I’ve been racing or autocrossing, there has always been that elite group of guys that just have it: They are the front-runners, the guys that have that swagger, the guys that you know are the ones to beat. The guys. Racers all know where they stand on that totem pole, whether they’re at the Solo Nationals, the Runoffs or a huge vintage race like this Watkins Glen SVRA event. They’re either one of the guys or they’re not. Guys like Vic Skirmants in his 356 and Jeff Snook in his TR3 are the ones the rest of us look up to and hope someday to beat. I had few expectations of this happening at this year’s Friends of Triumph feature. Not only had I never run Watkins Glen, but the experts told me that I wasn’t going to learn it in just one weekend. And to top it off, I arrived late on Friday and ended up missing my session, though I was allowed to take some laps in the enduro to familiarize myself a bit with the track. Even though I had a new engine, gearbox and cooling system, I took it really easy. I turned lap times in the low-2.40s, and nobody even noticed I was out there. I put a few corners together, but I still didn’t know my way around the track. If you can’t see and feel the track in your head, you can’t be one of the guys. Once you can do that—when you drive it in your head—you have taken the first step. I didn’t say much that evening. The car was running great. The guys at Abacus Racing had it set up better than it had ever run. I knew that on Saturday, despite my late start to the weekend, good things were going to happen. On Saturday morning, it was rainy. By 1:30, when it was our time to run in Group 3, the track had dried and I was ready, if slightly hungover from partying with the Triumph folks the night before. I felt good. The times told the story, as I turned a 2:29 in a bunch of traffic. A guy with a lot of experience at the Glen came by the beer party and told me that while 2:29 was a good, mid-pack time, I would not get much more out of Watkins Glen on my first weekend at the track. That morning, someone had volunteered to teach me the race track, but at that point I wasn’t ready. You can’t take advice until you know the track well enough to see every corner in your head. Until you’ve reached that point, advice is mostly just noise that will confuse you. And I didn’t need any confusion: It would take me another three seconds to get near the front of the pack. Snook was running a 2:26 and so was George Wright. Sunday dawned clear. Even though we had hosted the party the night before, I had taken it easy. Chuck and George at Abacus made a couple of slight adjustments and told me the car was ready to go. So was I. I was gridded in 21st out of 40 in the all-Triumph race. Once again, I felt good. I was happy with my position; after all, I was driving a TR3 among much faster wedge cars and TR6s in the race group. After my slow and late start at the back of the pack the day before, I was quite satisfied to be gridded in mid-pack. Could I move forward from there? The race started and I quickly moved ahead a few spots. Nobody was passing me, and I kept working forward as I managed to pass some and others dropped out. By the second-to-last lap, there in my sights was Jeff Snook. After 12 years of using his times as a benchmark and virtually never seeing him on track—well, except when he was lapping me—there he was. And I was closing in on him. One more lap and he was right in front of me. Somehow, within another lap, I managed to pass him. I looked ahead and I could see the leaders. I counted and realized that I was ninth place overall as the race ended. I was the fastest TR3 at the event. I had also won my class. I was ecstatic—I couldn’t believe it. Had I really become one of the guys that run at the front? On the cooldown lap, Jeff Snook pulled up beside me. “What is he doing?” I thought. “You don’t pass someone on the cooldown lap!” He didn’t pass me. He pulled up next to me, then just pointed at me and gave me the thumbs-up. He knew that for the last 12 years, I had used him as a benchmark. He knew how important that moment was to me—and he let me know that I was one of the guys. I was one of the slow guys. Thanks to perseverance, hard work, and hooking up with the right people, like E. Paul Dickinson and Abacus Racing, I went from backmarker to the front. You can, too. Hang in there, read all you can, practice, practice, practice, and you will get there. It won’t be easy, but you can do it. And when you get there, I want to be the first one to congratulate you and respect you as one of the guys—just as Jeff Snook did for me at Watkins Glen. The world has change so much in vintage racing that I no longer recognize it.. Back in the early 70's I was able to be a front runner/ winner in a Devin Bodied car with a $1500 stone stock Chevy small block Target Master that had the hydraulic lifters pump up and float the valves at 5800 RPM. By the late 70's that same car was mid-pack with 300 more horsepower and a whole lot of upgrades. Today, To be a front runner in that group requires massive budgets and the real dedicated approach you mentioned. Cheap, fun, affordable racing can still be had but requires finding those little niches and low dollar events that have received little attention of the big budget crowd. Here's the rub I run GT-Lite (the vintage version) becuase it's a more open class then then C-Sedan. First C-Sedan in my area is not heavily subscribed nor really is GTL but in GTL I can mix annd match parts more freely thus cutting costs by thousands. In general the motor, brakes and suspension bits are less stressed. Also by running GTL it puts me in a group where I race more for position. Granted I am racing against different class cars but I want to race for the top 5 overall. Tires are the only thing I can't get around, those gummy Hoosiers are $800 a set and realistically will only be competitive for 3 weekends tops........granted that's a full race season for me. Once they go south they're my track day tires. Now finally back to Tim's point there is indeed a great feeling of accomplishment when it all comes right and you run up front. This has to be especially so for Tim becuase he is so the wrong size to be a racing driver.........his center of gravity is way to high. I loved this article when it first appeared and believe it still stands true. There's plenty of originations to race with here on the west coast. You just need to ask yourself, how much do I want to spend, how much time can I dedicate, and how far do I want to travel. For me, it's alway about improving, whether that's lap times or car preparation, if I can measure the improvement, I'm happy. Race weekends are a family event, for the big races like the Rolex Monterey week, or Sonoma Vintage Festival, the idea of racing all day and celebrating after with the ones who support you all year with good wine and great food is priceless.